The Flatirons Tuning Rally Team completed their debut as a new team in the Rally America National Championship by winning the Production GT classification in their first event. After rebuilding the team due to suffering a severe crash at the Colorado Cog Rally in 2006, the newly renamed Flatirons Tuning Rally Team headed to the 100 Acre Wood Rally based in Salem, MO, with one simple goal, to finish. "This was a really important rally for us as a team. We have never rallied the car, I haven't even driven in a rally car for over a year, and have not driven a Production GT car in almost two years. Also, Scott has never co-driven for anyone else besides Tanner. We really needed to be able to finish this rally and get everybody working together and I needed to start working with the car again," stated the team's new driver, Stephan Verdier, when asked about the significance of the rally for the team. After many late nights and hard work by Flatirons Tuning technician Jon Brouillet to get the car ready and to the event, the team set quickly to the task of getting the cobwebs out and finding some speed on the stages. "Stage One was really important for us. I knew Stephan would be fast, that is why we wanted him as a driver, but I wasn't sure how we'd work together as a team and if we'd be on the pace from the start," commented co-driver Scott Crouch. Over the first three stages the Flatirons Tuning Team put up second place times, finishing solidly behind defending 2006 Champion Matthew Johnson, but also definitively in front of the rest of the challengers in Production GT. "It was hard running so much further back from Matthew, but we were running in second and it took me a while get used to rallying again and to get my confidence back," noted Verdier. Verdier later joked, "Scott was doing a better job of calling the notes than I was driving." 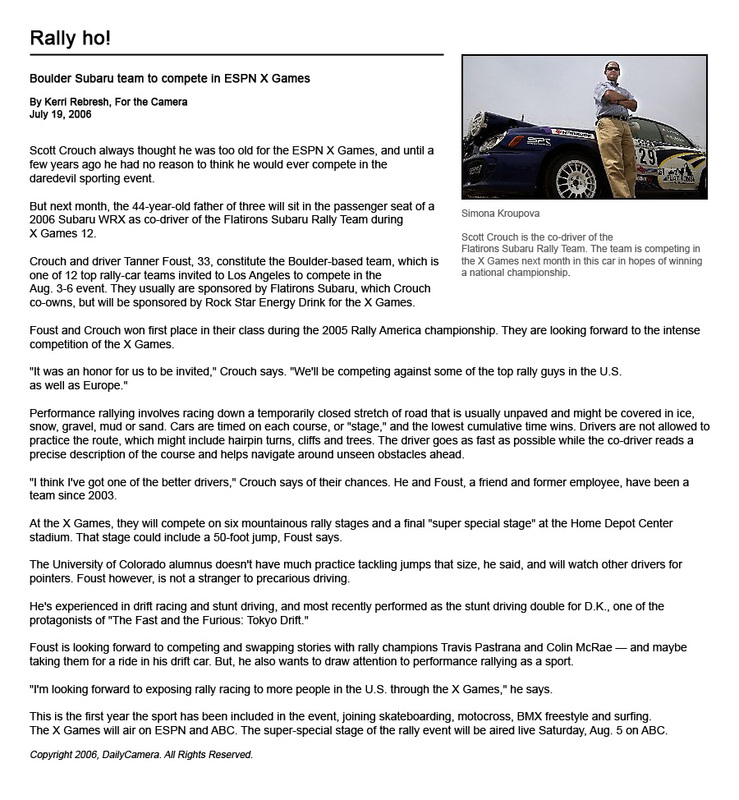 To complicate matters for the team the transmission in the Flatirons Tuning 2004 Subaru WRX rally car was popping out of fourth gear, a big problem on the high speed roads that make up the 100 Acre Wood Rally. "It was really hard to find a rhythm and attack the stages since I had to drive with one hand on the shifter, but still we managed to win a stage for Production GT and get closer to Matthew [Johnson] on the last two stages Friday," said Verdier. Saturday marked the second day of the 100 Acre Wood Rally as well as a change in the conditions. Rain had set in over the Ozarks soaking the roads that the rally was run on. The challenging nature of the stages with the difficult conditions became obvious on the first stage of the day as the Production GT leader, Matthew Johnson, crashed out of the rally. "Seeing Matthew on the side of the road out of the rally was a gift and a curse. We came to the rally to run it as a shakedown for the rest of the championship, but part of that meant we needed someone to measure ourselves against, which for us was Matthew, since he is the driver to beat. We were happy to be in first in Production GT, but nobody wants to take the lead at the expense of a crash," commented co-driver Scott Crouch. With the lead in hand the Flatirons Tuning crew took the rest of the stages as time to practice and really work on trying to find a comfortable rhythm on their way to the finish. When all was said and done, the Flatirons Tuning Rally Team stood atop the podium. "With all the hard work that the service crew put in to keep the car running and for this to be our first event, we couldn't be more happy to take the win in Production GT. Hopefully Matthew [Johnson] and Jeremy [Wimpey, Johnson's co-driver] are alright after their big crash. We can't wait to go to Oregon where the car will be a lot better and hopefully we can battle with Matthew and find a way to keep winning," exclaimed Verdier after the rally. Stephan Verdier, of Long Beach, CA, is a former top Production GT championship contender and has taken two overall rally wins to date in his rallying career. In addition to his duties as the driver for the Flatirons Tuning Rally Team, Verider also competes in the Formula D Drifting series where he will debut a new rear-wheel-drive Subaru WRX STi as well as participating in a variety of Time Attack races. Along with his motorsports exploits, Verider is a former French National Downhill Skiing competitor as well as former 2 times Winter X Games Skier Cross competitor. Scott Crouch is the General Manager of Flatirons Imports in Boulder, CO, home to the largest Subaru dealership in the Rocky Mountain region. Scott has been co-driving for over three years and won the 2005 Rally America Production GT National Co-Driver Championship as well as was on one of the first 12 teams to compete for Rally Gold at the ESPN X Games in 2006. Scott is the proud father of three children and is supported by his wife Libby. I had gotten that present for the my personal mother concerning Christmas time as she is your precious jewelry freak. Their one thing she cannot put on much of are, bracelets. I purchased her this appeal bracelet furthermore when she opened that yesterday she absolutley liked this! This time the problem is actually, her obtaining they on top of additionally down by herself. Haha... total very good item, it shipped as well as appeared very very early and also our mom was experiencing information technology. Thank one.